ATLANTA, Georgia, February 22, 2011 (ENS) – United Parcel Service, known around the world as UPS, has bought 48 heavy tractor trucks equipped to run on liquefied natural gas, bringing its long-haul LNG fleet to 59, the company announced today. The long-haul trucks will replace older generation diesel vehicles, reducing emissions from the UPS truck fleet while heading toward energy security. They are expected to produce 25 percent fewer greenhouse gas emissions compared to the older trucks and use 95 percent less diesel fuel than the vehicles they replace. Liquified natural gas, or liquid methane, is made by cooling natural gas to a cryogenic temperature of -126 degrees Celsius (-260 degrees Fahrenheit). At that temperature, natural gas becomes a liquid and its volume is reduced 615 times. “As a fuel, LNG is very dense, providing a large amount of energy for the amount of space it occupies. This makes LNG an excellent potential fuel for large trucks that need to travel a long distance before refueling,” he said. The new LNG tractors are manufactured by Kenworth, the only truck manufacturer to receive the U.S. Environmental Protection Agency’s Clean Air Excellence award in recognition of its environmentally friendly products. They are powered by Westport HD Systems. Based in Vancouver, Canada, Westport has developed proprietary cryogenic technologies to store and deliver liquefied gaseous fuels at cryogenic temperatures to gaseous fueled engines. LNG technology uses natural gas as the main fuel with a small amount of diesel delivered at high pressure to the combustion chamber. 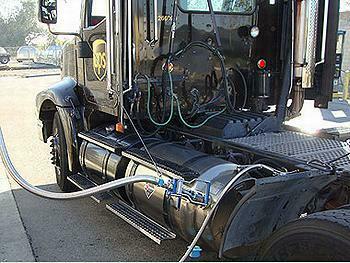 Westport estimates that 95 percent of the diesel fuel usage is replaced by energy generated from the natural gas. The U.S. Department of Energy estimates this displacement will amount to about 1.25 million gallons of petroleum annually. The new LNG-powered tractors will pull trailers on a transit lane linking Ontario, California, and Las Vegas, Nevada, along with UPS’s 11 existing LNG tractors. UPS plans to build publicly accessible LNG fuel stations in Las Vegas and will be able to access existing fuel stations in Ontario, California, and Salt Lake City, Utah, filling in an LNG trucking corridor that extends from California to Utah. Funding for the trucks and fueling stations is supported by California’s South Coast Air Quality Management District and the Energy Department’s Clean Cities program. UPS is the only private delivery company using this LNG technology in its fleet and now has more than 1,100 natural gas-powered vehicles in service. Besides liquified natural gas, UPS has deployed compressed natural gas, propane, electric and hybrid electric vehicles in the United States, Brazil, Canada, France, Germany, Hong Kong and the United Kingdom.